Bernie seems to be serious about changing the points system by replacing it with gold, silver and bronze medals as in the Olympics. His idea is that the driver with the most medals wins and this would avoid the situation where a driver only has to finish in the lower places to be champion. Apparently this would be more exciting for us, the viewers, especially as we are too stupid to understand a points system. Keith Collantine of F1 Fanatic has written many posts on the subject of changing the points system to give more recognition to race winners and the comments indicate that there is a lot of support for increasing the points difference between a win and second place. This makes a lot of sense as a mere two point difference is clearly not enough. But, when it comes to bringing in a whole new system of medals instead, support withers away and I am left wondering how Bernie dare say such a thing as, "Everybody is happy with the idea, they are all very supportive". No doubt his cronies think it is a wonderful innovation but they will go along with anything he dreams up. And I cannot believe that the midfield and tail end teams think much of it - their rewards are slim enough as it is and Bernie's system would just make it more difficult for them to have anything to show for a season's hard work. 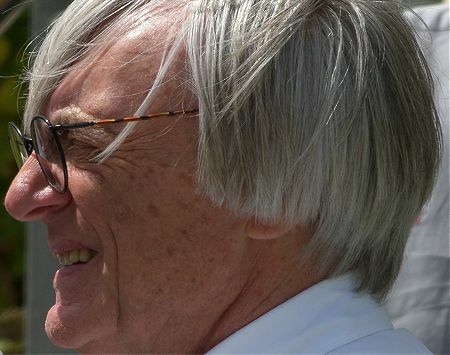 Bernie has pointed at 2008 as an example of bad results from the points system; Lewis Hamilton had only to finish in fifth place at Interlagos to be champion, after all. By a medal system, however, everything would have been wrapped up before the final GP, with Massa as champion, thanks to his greater number of race wins. What Bernie is missing is that the championship takes into account the entire season and not just the last race. It rewards consistency as well as pure speed, encouraging drivers to develop their skills to finish races, rather than go flat out and crash half the time. Like everything in F1, it is a matter of balance. If we look more closely at last season, we will find that it would have been extremely dubious to give the championship to the guy with the most wins. One of Massa's victories was awarded to him after the real winner, Hamilton, had been penalized in very debatable circumstances. Another win came to Massa by virtue of a broken exhaust on Kimi Raikkonen's car. The medals do not care; points at least reward Kimi for persevering at a slower pace and finishing second. Consider how easily the FIA will be able to manipulate the championship if the medal system is instituted - it is no wonder that they love Bernie's suggestion. There can be only one winner in each GP. Points give some value to those who fought hard enough to be in the minor places and make it worth their while to keep trying. Medals would focus far too much on winners and so discourage the rest of the pack as to make it pointless for them to continue. At a time when the field is dwindling as smaller teams find the costs too high, F1 needs medals like it needs a hole in the head. I have been following F1 since the early sixties and seen many alternative systems for awarding the championship tried and thrown away. There is some point in trying to adjust things to make a pretty good system even better; but to dispense with a system that has invariably provided us with the right champion and replace it with something that one man thinks might be a "good idea" is irresponsible, contemptuous of the fans and, quite frankly, insane. Bernie has been quoted recently as saying that he will never retire and that the day he does not turn up for work will be the day they lower him into his grave. On the evidence of this latest idea, I would suggest that he may be ignoring the danger of senile dementia that could take him out long before he finally bites the dust. There is an old saying that the powers that be in F1 need to be ever aware of: "If it ain't broke, don't fix it." This is simple enough. Bernie figured out that the Olympics make more money than F1 so in his great wisdom he came to the conclusion that it's all because of the medals. If there is a worse example of political tampering, cheating and lack of moral and ethical behaviour than the Olympics I haven't seen it....oops, I forgot about current F1. I wonder if Ecclestone bothers to watch the races or if he sits at the gate counting the take. "Medals would focus far too much on winners and so discourage the rest of the pack as to make it pointless for them to continue." If the drivers/teams are only ranked by the top three finishing positions, then yes, but there's nothing stopping them extending the rankings down to every position. Which they surely would have to do, because it's not beyond the realm of possibility that the two best-performing drivers could have equal numbers of firsts, seconds and thirds at the end of the season. I think it's fairer and simpler. Sorry Clive! Nick - No he didn't, Ecclestone first suggested this idea in the '80s. I am totally against the idea of medals. There was absolutely no need to change the 10, 6, 4, 3, 2, 1 system but as usual the FIA put in a long term fix for a short term problem. If there was a medals system 2008 is a perfect example of how the FIA could interfere with it. Going into the last race Hamilton and Massa had the same number of vitories. Except that Massa had a victory from Valencia because of the non-penalty for the unsafe release and he had the victory from the race he never lead in Spa. So Massa and Hamilton had 5 wins each despite the fact that in reality it should have been 7:3 in favour of Hamilton. Had the FIA and their stewards not meddled with the results of those race Hamilton would have been champion before Japan with a medals system. Given the that the reason we have the current points system was to prevent such an occurrence it seems odd for Bernie to be promoting a system that could see the championship decide one race after halfway. The other thing you have to consider is how would the grid react to a medals system. If I was running Toyota or BMW or Renault I would have my drivers qualifying on minimum fuel loads to get good qualifying slots. I would then tell the first driver to take of like a scalded cat at the start while the second driver held up the pack. If it was done ruthlessly enough my first drive would get a gold medal and my second driver would get a drive through penalty or maybe a nominal fine. There would be no sense driving conservatively for points. It would make a lot more sense to engineer a situation where you could pick up the occasional gold medal. Medals are cheaper than trophies. Keith: Oh, I knew you would disagree with me on this one before I started writing. We are going to have to agree to disagree, however - I think the idea is awful. If you're talking about giving more points for a win, then fine, I'll support that, but not medals. I really cannot see the point, since there will be so many ties that we'll end up counting points anyway. And I cannot understand why Bernie wants a system that could easily give us a champion two thirds of the way through a season. I may have asked this question before but here goes again: Can you name me one driver who won a championship yet did not deserve to do so? My fear is that any radical messing with the present system could introduce some really silly results and I see no need to risk it since the system isn't broken. Steven: You have pointed out one serious flaw in the medal system. I wonder how many more are lurking in it that we haven't noticed yet. Let us remember that every unnecessary change to the regulations introduced by the FIA in the last decade has made things worse, not better. There is no need to fix what isn't broken. Nick: Actually, the trophies haven't been mentioned yet - presumably they would still hand out the cups as well as the medals. Which sorta makes a nonsense of the cost-cutting drive. Unless Bernie has suddenly become friendly with Ron Dennis and has introduced the medal idea (all right, Keith - introduced it again) so that Hamilton won't keep insisting on keeping his trophies! I'm not convinced yet of this idea. The top 3 places seem to be heavily weighted and mechanical difficulties or the stewards I love to hate haven't been considered. The teams seem to like the idea so far so maybe they see something I don't. If you ask me, the last 2 races in Brazil where Lewis had to finish 5th have been pretty exciting. Don't be fooled, BMWF1Guy, Ecclestone's "everyone agrees" statement is worth about as much as Mosley's "majority of letters asking him to stay". So far, I haven't heard a single team owner's comments on the idea and I put no credence in Bernie's claim to 100% agreement. Okay maybe the points need tweaking so that there is more reward for fighting for a win rather than just settling for 2nd, but that's about all that needs a change with regards to point. With medals you'll have to have both the medals and some sort of point system (for countbacks when people tie) and it does introduce many other problems as well. How many extra people watched Brazil because it was a championship showdown (especially here in the UK) surely that's worth more to sport (both financially and for the fan base) than championships finishing early as someone's won more than 50% of the races, everyone might as well give up after that point. I think we all remember the really dominating years of Schumacher and they weren't the most memorable for anything other than that. Finally should we really take guidance on something like this from someone who as far as I'm aware never seems to watch a full race anymore, I seem to remember him saying that he leaves pretty much after the start on more than a few occassions. I've seen a number of posts about this today and the one thing that I have seen consistently omitted by all blogs is that the points system will still apply for the constructors championship. This will have a major effect on the drivers and the teams, as the teams will still want their trophy and they will still be rewarded for a consistently good championship campaign. The result of this years championship, as it stands, including the penalties (whether you like them/think they were undeserved/whatever) stand as the only championship that would have had a different result, under the old points scheme, since the current system was introduced. I wonder how this years championship results would look under each of the different points systems we've had over the years. Personally, I like the Medals idea, it rewards the driver who is consistently the fastest, not consistently mid-field with the occasional podium. Don't all the teams say they're there to win anyways? Dave: Huge numbers watched the showdown in Brazil, apparently and you're right, that will be a very rare occurrence if we are basing everything on race wins. It does not often happen that two drivers are close on the number of races won in a season. Bernie is only interested in money these days and so he wants to beef up "the show". I have argued against this concept often in the past, believing that the race is show enough to pull in millions of viewers and we risk making things worse, not better, by drastic changes like the one suggested. Leave well enough alone, say I.
George: So far, in fifty years, no driver has managed become champion without winning at least one race in the season - although, theoretically, it's possible. The closest was Keke Rosberg who managed it with only one win all year. But would you say he was an unworthy winner? In fact, I would argue that he was one the most deserving of champions, since he won in a car that was far from the best and his more illustrious opponents were too busy fighting amongst themselves and falling off the track. He won because he was consistently amongst the front runners, just as Kubica remained in contention almost to the end of 2008 through always being there to pick up the pieces. And I have seen plenty of people say he was the one who most deserved to be champion this year. Under the medals system, Kubica would not have come anywhere near the championship - and the whole season would have been less of a cliffhanger as a result. This is what we mean when talk about consistency - the truly great drivers who may not have the fastest car but can be a threat for the championship even so. To hell with the Schumachers who can win in the quickest car - half the field could do that. Keep the points system and we keep the chance that a truly talented guy in a lesser car can steal the championship at the last. That is a good point about the FIA rarely going back on a rule once made. However, judging by how successful it was to outlaw TC (again! ), I would say that they need to do it more often. Bring back the old points system, I say. Oh God it gets worse, dont tell me Bernie will want too present the medals personally. But I hear Max is interested in a German Equatorial. I never watch the Olympics, but I still hear the **** bleating on about the medal tally every four years. It drives me insane. So I'd hate for F1 to adopt the same sort of system. Maybe though, I am just scarred from Oz commentators who it seems point out that *Per Capita* Australia wins more medals than any other country blah blah blah. Like anyone cares ! Others might not have such an aversion to it having not been scarred in such a way, but I am sure a lot of other Aussies would agree with me on this that to introduce medals also introduces a very unpleasant win-at-all-costs mindset along with it, and where it only matters if you win - not how you play the game. Medals work fine in F1 predictions competitions, but that doesn't mean they would work in F1. The situation would be created where unless a driver was in a position to get an equal-personal-best result of the season, it would be a total waste of time for him to finish the race, let alone do the best possible performance. The team might want the best performance from a monetary perspective, but that's not going to be enough. If that driver is wavering because the car's not performing to potential, the system will not reward that driver to get the motivation back to perform as well as possible. All the team yelling in the world doesn't work then (as McLaren and Williams discovered when they employed Juan Pablo Montoya). 1 - Team orders. Why would Ferrari really let Kimi and Massa race each other for at least two thirds of the season, when they know Lewis would be collecting the win in nearly every race that McLaren has a better car? Better to just decide who will likely win and work hard for it. 2 - Drivers that suddenly get in unusual higher positions. What could Vettel do after his Monza win? He would suddenly be in 6th place of the drivers championship if no real hope of add any more to his numbers (maybe a bronze medal in a race with a lot of retirements), why would he really bother trying to fight for 5th or 6th place. 3 - No title contenders salvaging nearly lost races. Lewis might have ended Monza in 7th and Massa was just 5th in Montreal, but I doubt anyone wouldn't include those among the highlights of both men seasons, actually those races were more impressive than some of their wins. But what's the point when only wins or at best 2nd places would really matter. 4 Big strategy gambles. I have nothing against a team trying to gamble on a different strategy but under a system in which only podium matter I expect to see many smaller teams trying unusual pit windows or tyres and it would get annoying pretty fast. It's one thing whemn Hondas decide to trust Barrichello's talent on a wet track and gamble on his tyres, it's another when every smaller team is trying to find something that maybe works and turns and 8th or 9th into a 3rd, if it doesn't and the guy ended 16th, it doesn't really matter, right? 5 According to Bernie DC had a better season than Webber and that's very very wrong. Where do you find these charming pics of Ecclescrooge and the Grinch Mosley? Steven - "If there was a medals system 2008 is a perfect example of how the FIA could interfere with it." That's an argument again meddling, not an argument against medals. If Hamilton has finished sixth at Interlagos the championship still would have been decided by the Spa penalty. "If I was running Toyota or BMW or Renault I would have my drivers qualifying on minimum fuel loads to get good qualifying slots. I would then tell the first driver to take of like a scalded cat at the start while the second driver held up the pack. If it was done ruthlessly enough my first drive would get a gold medal and my second driver would get a drive through penalty or maybe a nominal fine." ...and the team would get thrown out for using team orders. I don't believe teams can manipulate the running order so brazenly and not get caught out by the team orders rule - which is why Ferrari didn't use Raikkonen to delay Hamilton at Interlagos. "Can you name me one driver who won a championship yet did not deserve to do so?" You have asked me that question before! And I don't think there necessarily are any such drivers, but the question isn't relevant to the topic. We're not just talking about changing a few numbers here and there, we're talking about changing the ethos of the competition and shifting it away from conservative points-gathering and towards going all-out for wins. I'm all for that. Keith, team orders have continued to be used irrespective of the rule against them. Had the rule been applied in 2008, Ferrari would have been thrown out for the switch-arounds in France and China, and I'm not sure McLaren (all season), BMW (Canada) or Renault (all season) would have got through the year intact either, given the low standards of proof used in FIA adjudications this year. The medals system simply increases the incentive to cheat, especially for the less-noticed midfielders. Since the result would have been radically different irrespective of system if the team orders rule had been enforced solidly and literally, the "teams using team orders would have been thrown out" defence does not work. It would in any case be very easy for a team to use excuses to get round the team orders rule. Let's face it, what steward is going to argue against a team which claims the switch was because of an exhaust failure or the other driver was suspiciously slower? Raikkonen wasn't used to block Hamilton in Brazil because the latter wasn't fast enough to be significantly blocked anyway - remember he was struggling to get round Force Indias let alone catch Ferraris that day. The team orders ban never needed to be invoked. The ethos change would seem to me to reduce the incentive to compete. There would be no point in a driver fighting back from a bad qualifying or engine change to get minor points if that driver already had a medal. Someone who got knocked off the track by a rival's stupid driving would be better off retiring than staying and fighting because of the long-life component regulations. Any situation where the driver isn't in contention to equal their best result (or get an insurance of one position below if they don't have a strong enough one) might as well not bother. This will especially impact drivers who are either lucky enough to score an early podium or are in a team which cannot keep up with the development pace. The driver market would change accordingly. Teams which were occasionally lucky would be favoured over consistent ones. This will lead to teams trying to become reliably competitive with the big teams struggling to even tread water, whereas teams that simply reserve their resources for the odd opportunistic race will become much better-resourced. Medals work at the Olympics (well, the finals of the Olympics) because they are one event and the aim is to get everyone at their maximum competitiveness at the exact same moment. But that's not feasible in a 17-race series no matter what rewards system is used. People will be competitive at different times, which means they need incentives to try their best on the off-days as well as the on-days. The points system does that. The medals system does not. Peril: I agree - there are some sports in which medals are appropriate but F1 is not one of them. Alianora: For the life of me, I cannot see why Bernie wants to introduce the medals system. It seems to have no particular advantage over points but many disadvantages. As usual, I suppose we are going to have to grin and bear it while the powers that be find out that they have screwed things up yet again. The 10, 6, 4, 3, 2, 1 system worked well for many years. The only reason it was changed was to try and keep the championship from becoming a Michael runaway...which it more or less did anyway. As Ali said, medals are fine for one-time events but make no sense in a series. In short, it's a bad idea. Perhaps B. Ecclestone should conentrate on dealing with his maritial problems rather than screwing up F1 any further than he already has. I remember a story about Bernie being at an F1 revival event where there were lots of F1 cars from the 60's. His comment while looking over the cars that carried little advertising and minimal sponsor id: This is what Formula 1 used to be like until I fu**ed it all up. True story. Filipe: I think you have listed some of the immediately obvious drawbacks to a medal system. As we saw with the new safety car regulations, there are plenty more lurking unseen as yet, no doubt. Nick: Trade secret, my friend. One has to be careful about copyright when it comes to photos but I have my methods. I also adjust existing photos, such as cropping, sharpening and changing color values where necessary. As an instance, the pic of Bernie used in this post is in the public domain but was the wrong shape for my blog - so I cropped it just to show his face, re-sized and sharpened it. Voila! A close-up shot of Mr F1 himself. It is an interesting question (well, it interests me, anyway). I might do another post on good places to find pics, similar to my recent one on Renault. Keith: You cannot have it both ways, sorry. As far as I have been able to see, the only argument you're putting forward for medals is that they award the championship to the guy with the most medals. If that is the main reason for doing away with the present points system, you cannot then tell me that my question is irrelevant to the discussion. The question is effectively asking why we should want to change a system that, so far, has never failed to award the championship to the most deserving driver of the year. I agree that you are seeking to change the ethos of the sport - but I think you will find that it changes in ways you did not expect. Notice that all the counter-arguments concern the drivers who don't really have a shot at the championship; the medals system would skew things so much towards winning that there would be no point in the also-rans taking part at all. In a climate where smaller teams are struggling to stay in the game, that is hardly a change that is needed. Don: I have heard that story about Ecclestone before - so it is either true or very popular! There have been other occasions when Bernie has admitted that he has changed F1 in ways that have not been good for the sport but I guess he excuses it by saying that it now makes money! "Gotta Go, Hedie`s space walk going peared shaped"
Heidi did a great job to recover the situation and it wasn't her fault the toolkit wasn't tethered inside the big bag like it should have been. As a result however there is a Nasa toolkit wighing 30 pounds(if it was on the ground) orditing agead of and below the ISS. The briefing late last night haf it 4000m ahead and 200m below. "That's an argument again meddling, not an argument against medals." The point is that it is a lot easier to manipulate things if you only have to consider three positions. i am sure the FIA rhought that they had done enough to give Massa the championship only for it to be lost due to a fifth place. Now Bernie wants to eliminate that possibility. "...and the team would get thrown out for using team orders. I don't believe teams can manipulate the running order so brazenly and not get caught out by the team orders rule - which is why Ferrari didn't use Raikkonen to delay Hamilton at Interlagos." If you have a team that can never attain a medal in a straight race you have to do something to get a result so why not take maximum risk? We have become used to hearing that the team did not issue orders, the drivers made the decisions. That is all anyone would say in the scenario I have given. Besides imagine the amount of coverage a team and it sponsors would get in that situation. Given that most teams are owned by car manufacturers they would love all the publicity that they would get while fighting against the 'tyranny' of the FIA. You may think that the bad publicity would drive sponsors away but that is simply not the case. No-one is ever going to get anything like as bad publicity as McLaren have had but they have a full set of sponsors. Why is it that we appear to look on Bernie as a bit of a Jack-the-Lad? We all seem to have a half affectionate view of his actions, unlike the broadly held opinions on Max and his minions. Bernard has probably done more to damage our sport than the FIA with over half of the money generated by F1 going to commercial interests proping up international banking! I am your age Clive,as a young married man I could aford to sit in the stands at Silverstone or at Brands for a GP without considering costs, if F1 is serious about saving money,get rid of both deadweights say I.
Ooh, I do feel better for that! "We all seem to have a half affectionate view of his actions"
Not me. I have no affection whatever for him. It was Bernie who put Max in place and for most if not all of Max's time in office Bernie operated him by remote control. Bernie is the real danger. Max is just someone he has used to get what he wants. The idea of giving 100 years of commercial rights for a pile of magic beans did not originate with Max. If you read back through the relevant sections of this site you will find comments from me around the time Bernie was calling on Max to quit saying that I thought that it was possible that this was a co-ordinated strategy between them to keep Max in office. As soon as Max is replaced by someone who is not part of his coterie the commercial rights deal is going to end up in court and Max and Bernie will be facing charges. I seem to remember Max saying that one of the reasons that it would be wrong to replace him was the need to immediately re-negotiate the commercial rights contract. This was odd as he disqualified himself from the original negotiations on the grounds of conflict of interest but as since he has been re-installed the urgent need for negotiations has disappeared. This is a sign that regardless of his lies he is staying for another term at least. I have no affection for Bernie either. Steven Roy said it all really - without Bernie the Poison Dwarf there would be no S&Max. Clive, interesting that you mention Bernie's Brqabham days, as Nelson Piuquet (the best driver Brabham ever had) would actually lost all of his three very deserving titles by Bernie medal idea. Which is a measure of Piquet's greatness, Filipe - Nelson had to fight hard for each of his championships against strong opposition and they were very closely run. Not many champions can say that.